How did ancient Israel come to be? Did the early Israelites enter Canaan from the east by crossing the Jordan River “opposite Jericho,” as recounted in the Book of Joshua? Or were the early Israelites already in Canaan as part of the indigenous population? The topic of Israel’s origins has been debated for well over a century by archaeologists seeking to use material evidence to fill out the picture described by the Biblical account. Hidden in the Jordan Valley in one of the hottest places on earth, the ancient site of Khirbet el-Mastarah may shed light on this thorny question of the origin of ancient Israel. Khirbet el-Mastarah contains numerous enclosures and structures, which appear to have been used by a nomadic or semi-nomadic group at the beginning of the Iron Age (c. 1200 B.C.E.). In their article “Khirbet el-Mastarah: An Early Israelite Settlement?” in the July/August 2018 issue of BAR, Khirbet el-Mastarah excavation co-directors Ralph K. Hawkins and David Ben-Shlomo examine the evidence. 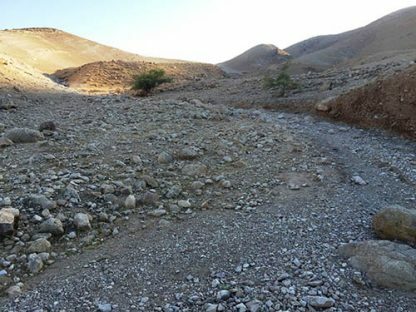 Archaeological excavations at the site of Khirbet el-Mastarah in the Jordan Valley may help to shed light on the origin of ancient Israel. Photo: Courtesy of Ralph K. Hawkins. According to Hawkins and Ben-Shlomo, the theory that the early Israelites had already been indigenous to Canaan—rather than had come into the land from the east—is in part based on the idea that there isn’t any evidence for early Israelites in the east during the Iron Age I (c. 1200–1000 B.C.E. ), particularly in the Jordan Valley. However, archaeological investigations in the Jordan Valley, from Adam Zertal’s survey of the hill country of Manasseh starting in the 1970s to Hawkins and Ben-Shlomo’s excavations today, are providing evidence for early Israelite origins. A 2.5-acre site primarily occupied during the Iron Age, Khirbet el-Mastarah lies in the middle of a wadi surrounded on three sides by hills. Excavations conducted at this ancient settlement in the summer of 2017 revealed stone enclosures, rectilinear rooms, and pottery dating to the Late Bronze Age II (1400–1200 B.C.E.) or to the Iron Age I (1200–1000 B.C.E.). To get a better understanding of the nature of this site and its relation to other sites in the region, the Khirbet el-Mastarah archaeological team researched current Bedouin settlements, reviewed ethnographic studies, and visited the nearby fortified site of Khirbet ‘Auja el-Foqa—identified as the Biblical city of Ataroth (Joshua 16:5) by Adam Zertal. One of the stone rectilinear rooms at Khirbet el-Mastarah. Photo: Courtesy of Ralph K. Hawkins. Take a closer look at Khirbet el-Mastarah and how the archaeological picture developing from the Jordan Valley supports the Biblical account of Israelites entering Canaan from the east by reading the full article “Khirbet el-Mastarah: An Early Israelite Settlement?” by Ralph K. Hawkins and David Ben-Shlomo in the July/August 2018 issue of BAR. Subscribers: Read the full article “Khirbet el-Mastarah: An Early Israelite Settlement?” by Ralph K. Hawkins and David Ben-Shlomo in the July/August 2018 issue of Biblical Archaeology Review. What makes ppl build and live in a wadi — a dry riverbed that is subject to periodic flooding? lord brought them back to the land that He promised them.